Building the BWA Super Womp NASTYCAR! 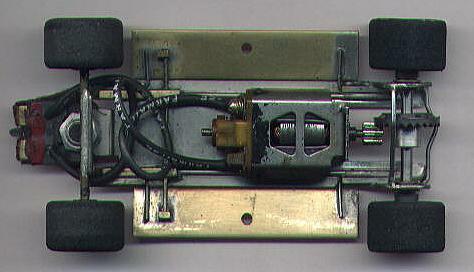 Although this chassis looks a bit complex, it is really quite straight forward and fairly easy to build, and is based on a Parma/Champion Womp/Thumper chassis. There are several types of Womp chassis, but I prefer to use the Champion Thumper, because of the raised strenghtening ribs, and the nickel plate, which makes soldering much easier. The first thing to do is to chop off the side pans, trimming them even with the rear uprights. 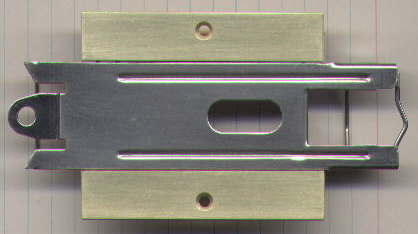 The new side pans are made from short lengths of .063 brass, cut exactly the width needed to go from the edge of the centre section to the outside edge of the rockers/sills. The side pans are hinged off the centre section, using short lengths of 1/16 brass tube soldered to the front and rear of the chassis centre section, with short lengths of .032 piano wire bent into 90 degrees, and soldered to the brass pans. Towards the front, a single piece of 1/16 piano wire is soldered to the centre section, and extends out over the two pans. 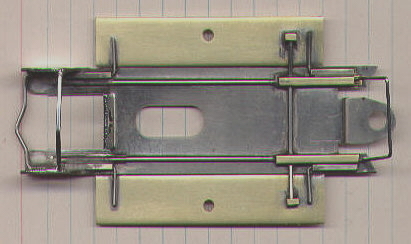 Two small lengths of 1/8 square brass tube are soldered on the brass pans, with the ends of the piano wire just resting inside the squares. By bending the piano wire up slightly, you can set the pans level with the bottom of the centre section. I also cut off most of the rear section, just behind the bushings, to get some weight out of the rear. Then, I add a couple piano wire braces, to stiffen up this area. For the front wheels, a couple lengths of 3/32 square brass tube are soldered just behind the guide tongue, and just inside the hinge tubes. A U-shaped piece of piano wire goes into these tubes, and is bent up at about an 80 degree angle The front axle tube is soldered to this piano wire. When it is finished, the whole front axle assembly can be slid in and out, to install or remove the guide nut. The important thing with this car (and actually all my cars) is to set them up with the front wheels fully on the track. I use the guide for guidance only, and have none of the weight of the car on it. To mount the body, I glue a couple wood blocks (1/4 by 1/4 basswood) along the entire length of the inside of the rockers/sills, and attach these to the chassis with two countersunk (from the bottom side) holes in the brass pans. I use 7BA (2/56 or 3/48 for the Yanks) countersunk screws to hold on the body. You can actually use the screws to "adjust" the handling of the car, by loosening or tightening them a bit.